When it comes to getting fit, I suggest you accept any help that you can get. Especially when you’re starting out, it’s extremely important to maintain that motivation. If you don’t you might fly off of the back of a treadmill and land right back on the couch. Being resourceful folk, we do know that we can always lean on an application to help us stay on the straight and narrow. If you have a busy work and/or family schedule which causes you to come up with excuses as to why you don’t have time to figure out a workout schedule, you definitely need the support of a great fitness application. Now we can’t get through Fitness Month at Mobile Nations without one of the most popular fitness applications amongst BlackBerry smartphone applications – Gym Technik. For years, we’ve covered its numerous updates for good reason; it is, in my opinion, the best workout partner to have by your side. Seriously, it helps you plan your workouts from their impressive library of routines, see written and video instructions for proper execution, upload progress photos and provide an in-depth way to track your results. Now I have reviewed this in the past but, with it being Fitness Month and all, I think it’s important to go over it. So check out the past reviews, and everything else Gym Technik, then have a look at what’s new. Running and Treadmill - to help increase your speed and stamina while running to be the first in line for the latest BlackBerry. Stair climber - in case your carrier's store is located on a floor above the one you are currently on. Cable Curl One Arm Standing - this will help you whip out your BlackBerry from your case/pocket/purse to read the latest email. Cable Wrist Curl - increases your BlackBerry up time, by eliminating fatigue experienced by hours of constant Berry abuse. Hanging Leg Raise/Oblique Crunches - helping me stay mobile while on my mobile by turning my keg into a six pack. I wish it hadn’t been so long since I used Gym Technik, but I am glad to see the new (to me) features it has. Like when I attempt to run or jog, I can launch a timer to help me keep track. I can launch using the L key and change the interval (time) using the + or – key. Once activated, a clicking sound can be heard- they should change it to the sound of a starting pistol. Once the clock hits zero, the app will play a beeping sound. Once you’re finished an exercise, take a quick breather and fill in your stats. Again, going back to running, you can enter you time, distance, calories burnt and level of resistance. After doing so, you can then view your past 5 stats to see your progress, or view exercise instructions. A resting timer is also included so you can grab that swig of water or that necessary breath. 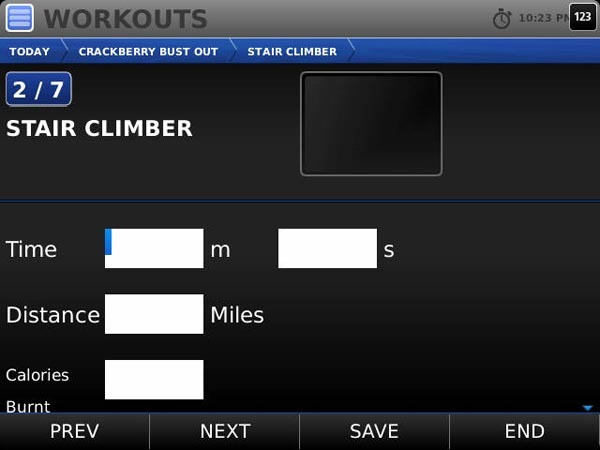 Now that you’re finished your entire workout, a summary screen appears, giving you brief stats for all exercises. The main menu keeps track of the activity summary. It shows, at a glance, what you’ve done today and basic stats (time, duration, etc). 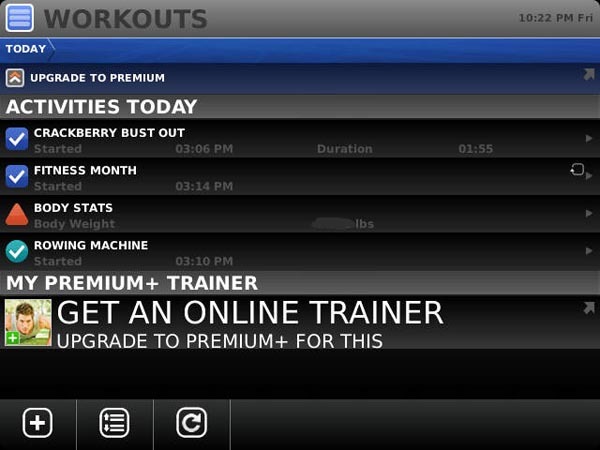 Also from the main menu is the workout summary. Of course, it’s not all about tracking workouts; you need to also track yourself and the results. At the main menu there’s an add (+) button at the bottom left. On top of asking you to start a workout or cardio, it will also ask you to enter your body stats, or to upload a photo. Stats include height, weight, BMI and body measurements. Over time, and with regular updates by yourself, these values can be captured on a graph for a visualization of your transformation. Exercise results can be graphed over time, as well. Gym Technik offers several packages to suit your needs. 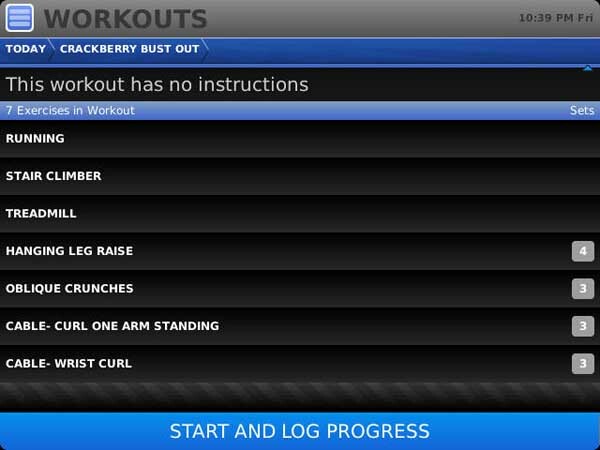 The free basic gives you limited access to workout and body stat tracking, graphing and photo uploads. Upgrading to Premium, gives you scheduled workouts (with email reminders), Resting and Recovery Timer, and streaming exercise videos (to name a few bonuses). As Kevin mentioned at the beginning of the year, a Premium + account gives you access to an online personal trainer and personalized workout plans. Gym Technik has a workout library where you can find about 60 workout routines. You can pull them into your library and follow/track in the gym on your BlackBerry. Premium members get access to premium workouts in this library, where their certified trainers publish about 10 new workouts a month. So it's like getting access to new plans every month the same way one would from a fitness magazine. According to Gym Technik, this is a feature the premium members seem to love, and a great starter for the basic members too as the 60 routines can easily last half a year. Not only is it an in-depth workout resource, but it’s also an in-depth recording and reporting tool. Although Gym Technik has a long list of options, it is not difficult to use. You are then able to make sure to keep your mind focused. The support they offer is also amazing. From email, to description, to media; you are covered. The only bad thing I can think of is the price. Not everyone may agree with the price of Premium and Premium+. I say that getting personalized plans from available trainers for $30/month at the most is a great deal. While I could say I regret not using Gym Technik for so long, I should be happy that I can do so now with some new-to-me features. The reporting really gives you a good look at your accomplishments; which helps you stay motivated and see your goal to be much more achievable. Whether you go it alone, or with a trainer, this application will help you optimize your time and your exercises. Then you can go from CrackBerry chunky to CrackBerry chiselled.